I’ve FINALLY made a Pinterest page! 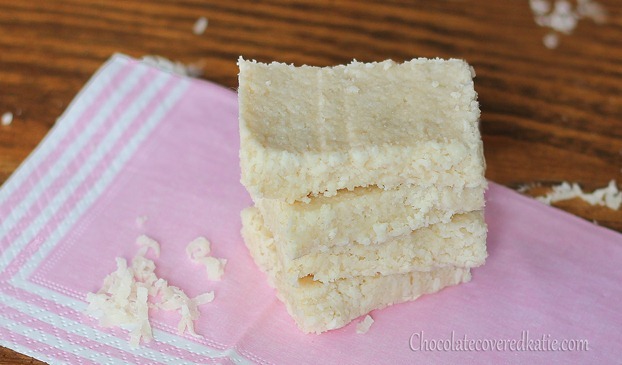 These no-bake coconut bars are completely addictive – and you can make them in less than 10 minutes! As if I needed yet another addictive no-bake recipe on the blog. Oh but one can never have enough no-bake recipes, right? Especially when there is coconut involved. You know what else one can never have enough of? Obviously I would say chocolate. The eleven different types of chocolate bars in my kitchen pantry attest to that. My roommate would say makeup, as her collection could stock three separate branches of Sephora. My sister would probably say shoes. Although she might say nailpolish. She really does have a lot of nailpolish. And one can never have enough coconut. Except maybe my crazy boyfriend who just yesterday informed me that he doesn’t like coconut. I think I stared at him blankly for over five minutes, trying to comprehend that statement. Fill in the Blank: One can never have enough ________. Dishes? Scarves? Jars of peanut butter? I’m also going to throw jeans and bathing suits onto my list, because even with all the ones I already own, I always want to buy more. Oh, and puppies… I can’t go into Petsmart on adoption days for fear of taking home all the rescue puppies! 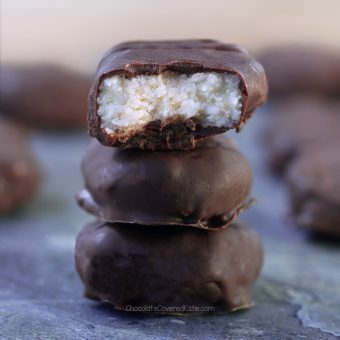 If you make these coconut bars, be sure to rate the recipe in the comments below or tag @ChocolateCoveredKatie on Instagram so I can see and like your pictures! Combine all ingredients in a food processor. (Mixing by hand will still taste good, but the bars will crumble.) Squish into any small container–I used a 7×5–and refrigerate for an hour before trying to cut. Or freeze for 15 minutes. Can be stored in the fridge or freezer, for at least a few weeks. OMG my boyfriend can’t stand coconut either! Crazy and annoying because I LOVE it!!! I personally could never get enough sweets (all types). Candy, cake, cookies, ice cream… anything. Love them! My husband doesn’t like coconut either, what’s up? Maybe it’s a male thing? Must be because my husband doesn’t like it either! But my sister and both LOVE coconut – and dk chocolate, especially! Not a male thing. Coconut is my favour flavor. I use to get in trouble when I was young for “borrowing” the shredded coconut container and just going to town on it in my room. Mine too!! Coconut must be a female thing. They don’t know what they are missing!!! I must be an exception, cause I’m definitely female and I’m definitely not a fan of coconut. I can handle it very sparingly if it’s more garnish than main event. I made these bars for my mother though, she absolutely loves coconut. As far as males go: my dad doesn’t like it, but my brother does. So I’d say just like with anything else, everyone has different tastes! They taste a whole lot like these crack bars except the chia seeds and they are a little chewier. Suggestions? 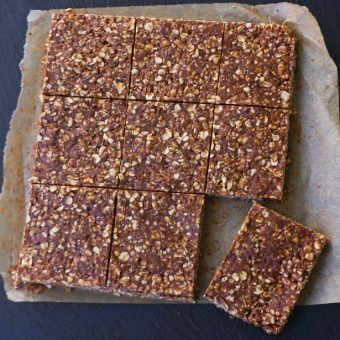 After reading this comment I just made these for the first time only with honey instead of maple syrup or agave, and I added a little over a tablespoonful of chia seeds. 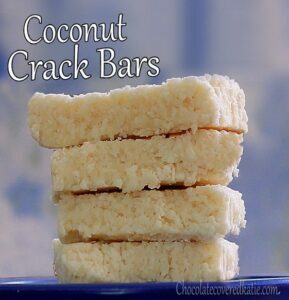 They are wonderful and definitely live up to the name “crack”. My hubby doesn’t either, I LOVE it!!! Sorry girls… I also hate coconut! Not just a man thing! Both my dad and my boyfriend love coconut! do u have to melt the oil first? 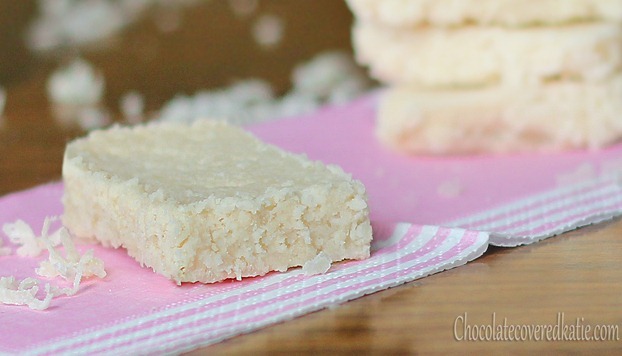 Coconut Crack Bars So Cold from Freezer on Hot day Perfect Treat for COCONUT Fans! So these are crazy addicting! Made them and devoured them. I melted dark chocolate and dipped one end of the bars into it and then let it solidify in the fridge. Overall, they are incredible. Was very impressed. I’ve never been in love with coconut and the bf hates it but … just for you … I may have to give it another shot! 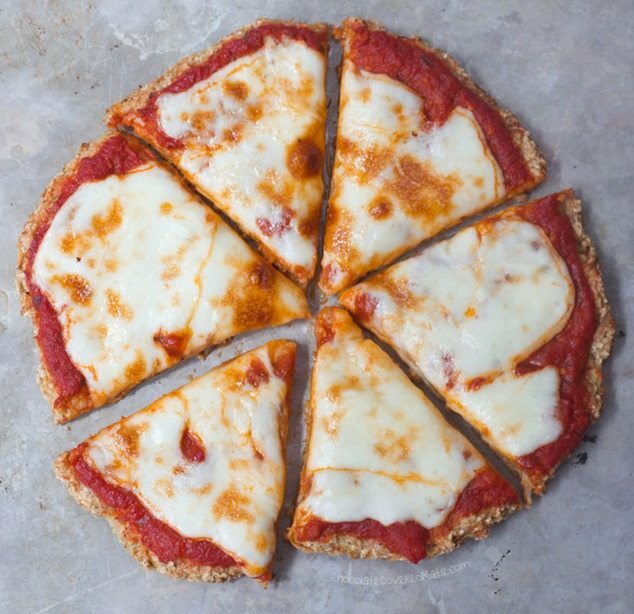 You are my new favorite food blog site. Thank you for sharing your yummy recipes. Can’t wait to try these! Love coconut! Hi I love your blog!! I was just wondering if you had any books or cookbooks for someone who is new to the vegan lifestyle? Thanks so much! I am so glad you posted this. Nobody in my family loves coconut as much as I do, and most of my friends are sort of neutral to it. I don’t understand! I get jars of coconut cream (tropical traditions and nutiva are the best I’ve found) and eat it with a spoon! I guess coconut cream and coconut butter are the same thing… It’s just all the parts of the coconut (oil, meat, milk) blended together to make a peanut butter consistency. If you come across it you have to try it! Sounds delicious. Have you tried it with peanut butter or nutella in a sandwich? @Emma — Reading through the comments, your condensed milk bit had me intrigued. I just made this recipe the other day and used vegan sweetened condensed milk, and it came out amazing! Thanks for the suggestion. And thanks @Katie for the original recipe too! This stuff is addictive. There’s sweetened condensed coconut milk and I like it better than the dairy milk. It’s so good! You need to try the almond butters at Amazon. The flavors are Pecan Pie , Blueberry Cinnemon Bun, and Chocolate Chip…they are all amazing. I can’ Buy them cuz I can’t stop. Pecan Pie really does taste like the pie, it is super in a shake! I can’t wait to make these! I’m all out of maple syrup though. Have you tried them sweetened with honey? I’m impatient and think that I’m going to have to try these with honey 🙂 Thanks again for another fantastic recipe! I haven’t… it might be a little honey-flavored, but as long as you don’t serve it to any strict vegans (who don’t eat honey), I don’t see why it wouldn’t still work! Coconut oil is good for you! Did you need to add extra liquid ingredients when you added the protein? LOVE me some coconut! ….I want to take a huge bite out of that! But I have like 14 colors so far. Obsessive much? You don’t know the half of it. 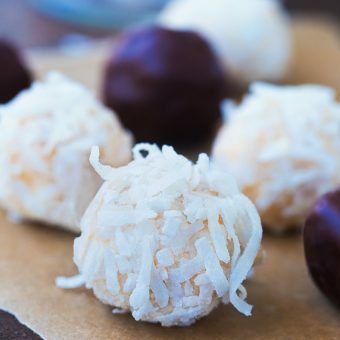 I will have to go try this… but I probably will need to use lowfat coconut for my parents to agree to making it. Made these tonight, yum! I melted some dairy free chocolate chips and spread on top, tasted like a Mounds bar, super yummy!!! I made them and covered the top with chocolate coconut butter. Like a mounds bar. So yummy! Hmmm… these sound delicious. Mounds is one of my favorite candy bars so I’m sure I’ll love this. Where can I find unsweetened shredded coconut and virgin coconut oil? The baking aisle in my grocery store has sweetened shredded coconut. Thanks! I found my coconut at Whole Foods, bulk section. Trader Joe’s Has reasonably priced organic virgin coconut oil. Can not wait to make these!!! Oh really? I did not know – That’s awesome!! I have a huge bag of Bob’s Red Mill I got at Big Lots w a 20% off coupon. Great deal and product if you have a Big Lots nearby. Oh wow that’s a deal! Thanks for letting me know! Also, Troical Traditions sells it. ? This sounds great! Coconut is so yummy! I would really love to see a healthy version of those bars that are made out of cereal and corn syrup and topped with peanut butter and chocolate melted together! Do you know what I’m talking about? They are SOOOOOOOOOO good. Scotheroos? They’re kind of different than you’re describing, but maybe? Ya I just googled Scotheroos…YES YES YES! So DELISH! I always made them with chocolate and peanut butter but my friend says she makes them with butterscotch chips too so that makes sense they’re called Scotheroos. YUMM!!! I always put the peanut butter in with the rice krispies and corn syrup. Then chocolate and butterscotch on top. So good. 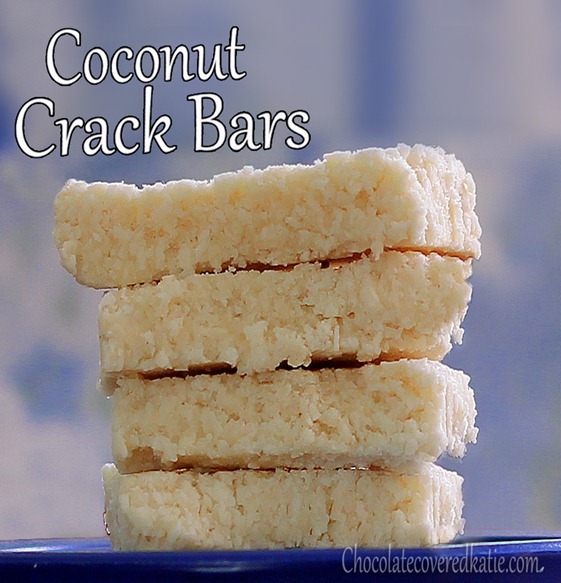 You know, the Coconut Crack Bars would be REALLY good, and look really pretty, too — with a little chocolate drizzled over the top of them!! Might have to give that a try!! Thanks for sharing all your wonderful recipes!! 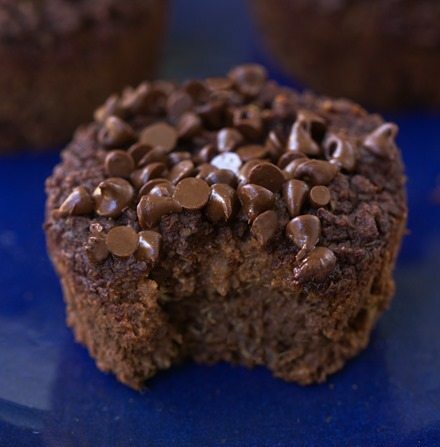 That’s what I was thinking too…it’s like a homemade Mounds bar, but healthier! Can’t get enough of: frozen blueberries in almond milk, sprinkled with truvia. I love the stuff. Let it sit for 5 minutes & the milk turns ice. I thought I was the only one who did this? Hahaha it’s delicious! I need to make these soon! They look so delicious! My boyfriend also doesn’t like chocolate, but that just means more for me! I know! I’m super excited too.. but I think all the recipes in the cookbook are going to be new ones… so nothing from this blog.. I wish we could get a cookbook with all the best recipes from here though… like the cookie pie! It’s going to be a lot of new recipes, but also some of the old ones. I think the cookie pie will be in there!